Want to take your business to the next level? Business Elevation is about taking your business to the next level. Wherever that may be. We help by building bespoke programmes to help business leaders from solo-preneurs to small and medium enterprises to make that transition. For small business elevation is about coaching to make a business step change. For larger organizations it is often about building more engaged organizations with engaging leadership and engaged teams that get more of the right things effectively done. At Chris Cooper, Business Elevation we help organizations elevate performance by supporting them with the development of engaging cultures with engaging leaders and engaged teams that get the important things done. When you invest in the quality of thinking and behaviour of your people and engagement rises so does the performance of your business. Your people deliver more, your staff turnover goes down, morale in the office is higher and your teams are prepared to go the extra mile. Elevation is a concept that we are delighted is now talked about in Board Rooms and by acting as a trusted partner we provide support that can make a major contribution to your results. We work with universities, large companies and many small and mediums sized businesses. In the case of Everard’s Brewery whom we have worked with for 13 years, during that period they have won the best company in their sector award four times! And the MD won Leicesters Business Executive of the Year Award in 2014. And if you are not sure that these three principles are important then consider the performance of Leicester City Football Club. 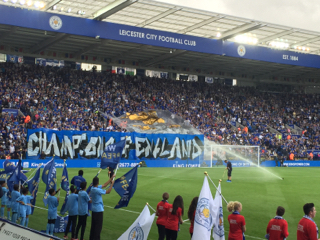 As a season ticket holder, Chris saw them struggling at the bottom of the Premier league, until with new engaging leadership, development of an engaging team (on and off the field), clarity about what was needed to be done and near perfect execution, Leicester defied 5000/1 odds to win the Premier League in 2016! Do you want to stand out from the crowd in your industry and are you prepared to do what it takes?